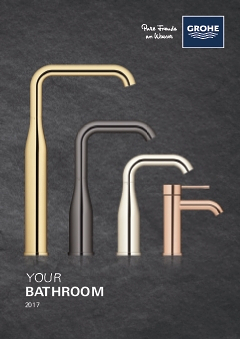 Sculpted into flowing lines and presented in the dazzling GROHE StarLight chrome finish, this Eurodisc Cosmopolitan range bathroom tap has a contemporary look that will make an immediate impact as part of your bathroom scheme. Its outer beauty is matched by a range of similarly enticing functionality on the inside: the GROHE EcoJoy water-saving technology caps your water use at 5.7 litres per minute, and the GROHE SilkMove cartridge lets you serenely set water temperature and flow. With our SpeedClean anti-lime system, a gentle wipe is all it takes to remove any limescale residue from the spout. Designed from scratch with optimum ease of use in mind, the GROHE QuickFix PLus system guarantees that installation will be quick and trouble-free.